My thesis in three minutes | My research journey. 1. Communication style: was the thesis topic and its significance communicated in language appropriate to an intelligent but non-specialist audience? 2. Comprehension: did the presentation help the audience understand the research? 3. Engagement: did the oration make the audience want to know more? Maria is a 19 year old student who has finished high school in Chile. She wants to become an English teacher so she has just enrolled in an initial teacher education program at a prestigious university. Maria is the first member of her family who goes to university, she wants to be an educator to make a difference and contribute to bridge the inequality gap in the Chilean educational system. Maria is very enthusiastic about becoming a teacher of English. She likes English very much and she wants to change the fact that only 2% of the Chilean population speaks English. Though English was compulsory at school for eight years, Maria never learned how to speak the language; Now, in four years time she has the challenge to become a competent qualified teacher, and in English. Maria’s first classes at Uni are all in English, she feels confused, she believes that in her first classes of English she would be taught some grammar, and that Spanish would be used in the class. She talked to her teacher about it and the teacher said that you learn a language speaking it. Maria doesn’t agree, she thinks that before you speak a language you need to understand it. She talks to the director of the program so as to understand how she is supposed to learn in this new context. The director agrees with her teacher that she needs to speak English to learn it and that the program is very demanding because this needs to meet the national standards and accreditation criteria. As a teacher educator, I see how student teachers struggle with their courses, their own previous learning experience, their teaching practice, all that and more, to learn how to teach English. As a teacher educator I am a witness of how they start developing their own theories on language teaching. In this context the question arises: How do prospective teachers construct their own beliefs and knowledge about language teaching and learning? 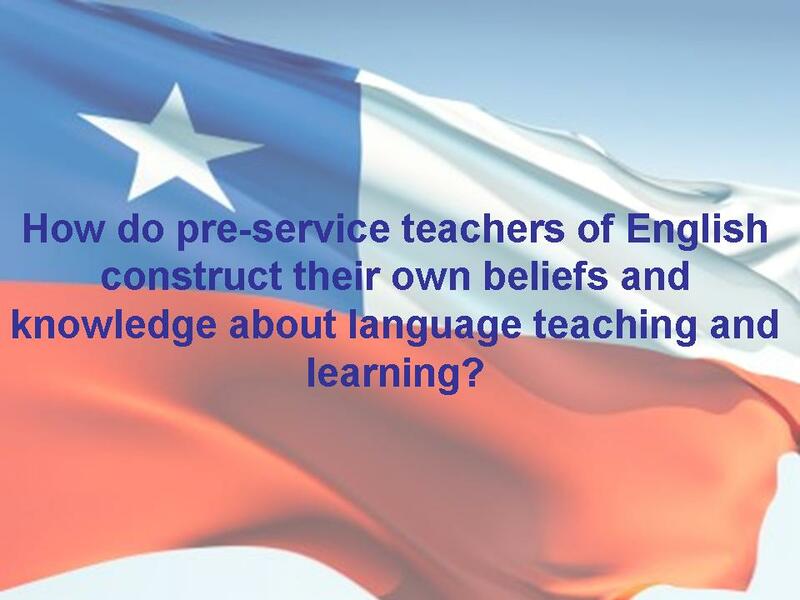 This study explores the process of learning cognitions for Chilean English as foreign language pre-service teachers, i.e., what teachers think, know and believe, about teaching and learning English in Chile. This study will analyse how student teachers construct their cognitions from a sociocultural perspective. This lens will enable me to understand the complex dynamics between the pre-service teachers and the social situations they are engaged with in the construction of their own cognitions about language teaching and learning. This examination will shed light on the understanding of how Chilean student teachers understand their own experience of learning and how they learn their cognitions towards teaching. I am socially driven with the need to explore on EFL teacher education in Chile to understand this context and to suggest possible changes of improvement. Ultimately, I intend to make a contribution to teacher education and the educational system of my country, Chile. Qué paso con la versión en español…..??? ?